The dog, not the place. I think it is safe to say that no member of our family will feel a move from the UK back to the states more keenly than our lovable almost 7 year old Gordon Setter, Dixie. In England dogs rock. She’s like a super model only with really bad teeth. Here she is sporting some antlers a few days before Christmas (blame it on husband). Dixie absolutely loves riding in the car with the top down but honestly, I think she was embarrassed by the antlers-see super model comment above. It was a gray cloudy day (shocking I know) and when people saw her coming down the High Street in town they smiled…every single one of them. Dixie was their day brightener. She acted like a pageant queen celebrating her reign with a parade. The reality was a little bit more like How the Grinch Stole Christmas. Today I stopped by my friend Sarah's house to say goodbye. She and her husband are moving back to the states in a few days after 9 years in the UK. I think this is the hardest/worst part of ex pat life...the constant goodbyes. About 1/3 of the expat community turns over in a given school year. In fact, at the end of our first year here my then 8th grade daughter saw 16 of the 60 students in her grade move away. Shell shocked would be a good way to describe how she felt at the end of that school year. There really is no easy way to handle it and everyone has their own coping strategy. Living in a foreign country on a corporate assignment is a bit like going off to college. There's a real 'we're all in this together' mentality that allows close friendships to form quickly and the community to become almost like an extended family. We originally came to the UK thinking we'd be here for 3 years and we are rapidly approaching year six. If you had said to me 5 1/2 years ago that I'd be living on one continent and my children on another I'd have said you were crazy. I'd have said I couldn't do it, wouldn't do it (insert stomping feet here). But, here I am doing it and you know what, it's okay. Better than okay most days. I've realized that God has a way of preparing us for whatever season of life we are embarking upon and the almost empty nest is no different. We love it here. We also love it there. Sometimes people don't understand how a foreign country can feel like home but home is where you live and home is people you love and home is about so much more than your street address. I so look forward to all that is in front of me, returning to the US, most especially being on the same land mass as my children. I also know that a little part of my heart will always belong to England. We (hubby and I) took a drive to Kent today and visited Leeds Castle. It's about an hour and 20 minutes from our home and it's something I've wanted to do since we arrived in England. I'm starting to feel the pressure to see and do as much as I can before we move. Leeds is often called the most beautiful castle in England but I must say Windsor Castle is still my fave. 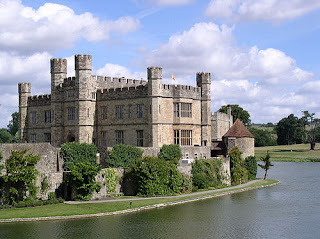 Leeds Castle was started on the sight of a Saxon Manor by a descendent of one of William the Conqueror's lords in 1119. It moved into royal hands in 1278 and over the course of about 150 years six medieval queens held the property. Henry VIII and wife number 1, Catherine of Aragon (see I have learned stuff and more about that later) visited from time to time and his son, Edward VI, gave the castle to one of Henry's courtiers for his services. Since then it has been in private ownership and was at one time the home of the Culpepper and Fairfax families. Yes, of Virginia fame...we do love hearing about American connections in our travels. Anyway, the sun was shining (a real treat! ), it was cold cold cold, but we enjoyed walking thru the castle and especially the grounds which include a duckery, (didn't even know that was a real word but apparently it is and, while I'm at it let me just mention that where there's a duckery you will also find plenty of duckery doo! ), a very large aviary of exotic birds and, of all things, a dog collar museum. That's a first for us. Now, back to things I've learned while living here....the kings and queens of England for starters. Not long after we moved here I was telling a British friend and her husband that I have trouble remembering the kings and queens of England in order. I mean, after all, they do all seem to be called William, Edward, George or Henry. I really did want to understand where each falls in history's timeline since this country is absolutely jam packed with about a billion interesting and important bits of the past and I think it's important to know who ruled what when. I think you'll agree with my previous statement that almost all are indeed named William, George, Edward, or Henry. And...that you really are never too old for rhymes. I decided today was as good a day as any to begin the big clear out. That is, dejunking the house in anticpation of an upcoming move. We know we will be moving somewhere, sometime, and since I've moved house more than a few times in my life I excel at the get-ready-for-it drill. I started in my bedroom and was immediately sidetracked by two old journals I found in my nightstand, one filled with funny things my younger daughter said as a toddler. Did I mention I also excel at procrastination?? Anyway, since I'm pretty new at this empty nester thing I allowed myself to indulge in a bit of nostalgia as I sat on my bedroom floor and enjoyed the memory of daughter 2 at the tender age of 5. I can still hear her thanking God in her nighttime prayers for her 'strong healthy body...cuz without it I'd just be a head.' : ) Not exactly the point her kindergarten teacher was making in the day's lesson on good health but a point taken none the less. Of course reading the old journals led to a phone call with said daughter in the US which left me feeling all emotional and jiggly so I moved on to something physical--shredding paper. There are so many uncertainties in our circumstances at the moment (like the when and where but I'll try not to keep harping on that!) A move brings many things into one's life, and at the outset of the process (and the mid point and the home stretch too!) most of these things are stresses...new job, new home, new friends, or even worse, no new friends!, wondering how I will ever find a hairdresser who will get the exact right color of my highlights, and on and on it goes. Since I'm definitely a glass half full kinda girl and always looking for the upside, I've learned that one of the bright spots in the dark cloud that is relocation is the opportunity to start fresh, in every sense of the word. While it's often wrenching to let go of a home I love, a neighborhood we're comfortable in, friends who are like family in this country we call home, and even the village shop whose owner knows me by name, I can also let go of the expectations and obligations that come with life in a particular place and time. Moving provides an opportunity to step back, re-evaluate my priorities, focus on what's really important. I can see where I've been, how I've spent my time, and most importantly where do I want to go from here. I gotta be honest and say that sounds a bit daunting but isn't it in the midst of life's greatest stresses (and moving/job change generally rank up there in the top 10 of life's stresses) that we hold onto our faith just a little bit tighter? I may not know exactly what the future holds or how the million little details will fall into place, but I can rest easy in the knowledge that the God who loves me does. And it is precisely because God is all about the details that I can choose to feel a sense of excitement instead of anxiety; instead of worry, I choose hope. I've been thinking of starting a blog for a while now and have finally decided to adopt Nike's motto and 'Just do it!' I'm in the midst of a real time of transition and want to record some of my thoughts as I prepare to relocate back to the US after living abroad for the past almost 6 years. Friend: So, what are your plans? Me: Um, well, hmm, we aren't sure but we think we're moving back to the states. Friend: Oh, where will you go? Me: umm, well, hmm, somewhere, we haven't been told yet. Friend: So, when will this happen? When are you going? Me: umm, well, hmm, sometime, we haven't been told yet. We are definitely maybe going somewhere sometime. Friend: Ahh.... limbo....that's a hard place to be. I looked up the definition of the word in my trusty Websters and here it is...'an intermediate or transitional place or state.' Sigh...'tis oh so true.